A 30m roll of heavy duty garden tying wire from the Gardman range of garden tools & equipment. PVC coated with strong 2mm thick metal wire core. This Gardman general purpose, heavy duty garden wire is an essential for any gardener. Each roll contains 30m of garden wire. This heavy duty garden wire is 2mm in diameter (metal core and plastic coating) making it strong and suitable for many purposes, including all types of tying, training and fixing. This garden wire is PVC covered to make it rot-proof and long lasting. 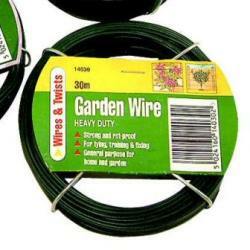 This heavy duty garden wire qualifies for FREE POSTAGE.